Due to market volatility we cannot accept any returns or exchanges on MTG singles. We do accept returns on un-opened sealed products and supplies within 3 days of delivery. Please contact info@oasisccg.com if you would like to return an item and we will give you instructions on how to ship your item back or bring it into our retail location. 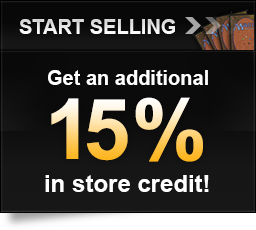 We strive to have all MTG singles in stock for all of our customers at all time, especially players who need cards for their decks. For this reason we limit customers to eight (8) copies of any card of the same name in a 72 hour period. For example a customer could order 4x NM Squire and 4x SP Squire cards, but if they order 8x NM and 8x SP the played copies will be removed from their order, a refund given, and only the 8x NM copies that were ordered will be shipped. Due to volatile market pricing and occasional inventory errors we also reserve the right to change or cancel orders as necessary. Should this happen you will be contacted to confirm that the order is still desired in its new form before it is shipped out. A card in Near Mint condition will show little to no wear. It may have a light scratch, small nick, or barely noticeable border wear. A foil card will have little to no clouding and retain most or all of its original gloss. A card in Slightly Played condition will show visible, minor wear. It may have mild border or corner wear, minor bending, light scratching, small nicks, light scuffing, or very minor border creasing. A foil card may also have moderate clouding and have lost some of its original gloss. A card in Moderately Played condition will show easily visible, but not extreme wear. It may have more extensive border or corner wear, slight bending, scratching, major nicks, scuffing, slight creasing along the top border from shuffling, moderate whitening, minor dirt buildup, or slight discoloration. A foil card may also have major clouding and have lost most of its original gloss. A card in Heavily Played condition will show visible and heavy wear but will be tournament playable in a sleeve. It may have extensive border or corner wear, major bending, major scratching, major nicks, major scuffing, major creasing along the top border from shuffling, heavy whitening, inking along the borders, writing on the back or front, slight tearing along the borders,major dirt buildup, or discoloration. These will be tournament playable though! A card in Damaged condition is any card which we would not allow to be played in a tournament and would be marked in an opaque sleeve. Oasis Games is committed to protecting your privacy. Any information you have provided us with is used solely for the purpose of processing your order and providing support if any errors occur. We use a Secure Server for collecting personal and credit card information. The secure server layer (SSL) encrypts (scrambles) all of the information you enter before it is transmitted over the Internet and sent to us. Furthermore, all of the customer data we collect is protected against unauthorized access. Oasis does not sell, trade, or rent your personal information to others. Oasis may provide aggregate statistics about our customers, sales, traffic patterns, and related site information to reputable third-party vendors, but these statistics will not include personally identifying information. Oasis may release account information when we believe, in good faith, that such release is reasonably necessary to (i) comply with law, (ii) enforce or apply the terms of any of our user agreements or (iii) protect the rights, property or safety of Oasis, our users, or others. Oasis also provides links to affiliated sites. The privacy policies of these linked sites are the responsibility of the linked site and Oasis has no control or influence over their policies. Please check the policies of each site you visit for specific information. Oasis cannot be held liable for damage or misdoings of other sites linked or otherwise.